For most entrepreneurs, making an ‘exit’ is a once in a lifetime achievement. For Spot.IM’s founder, Ishay Green, it’s just another Monday. Green, 37, has no less than three successful exits on his resume, two of which are from startups he personally founded: Onigma and Soluto. Starting as a teenage whiz, Green has been working in the startup scene since he was 15, and is now one of Israel’s most influential entrepreneurs (and in the startup-nation, that’s saying something). His personal brand of enthusiasm has bought him as much fans as his top notch programming skills, and if our interview is any indication, he’s not showing any signs of slowing down. 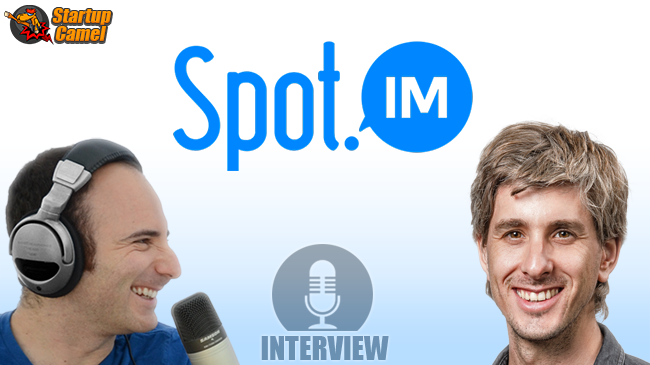 Social Media is here to stay, no argument about that, but the companies who are reaping its benefits are about to change thanks to Spot.IM. Right now, social channels like Facebook and Twitter monetize content they didn’t create in the first place, thus taking a generous piece of the original publishers’ pie. But what if those content sites could create their own social network that would keep their readers inside their site? That’s exactly what Spot.IM does. The Startup’s tech easily transforms any comments section into a living social network, where readers who are already engaged (remember, they scrolled down to the comments for a reason) can discuss said content with other readers and form a community. Spot.IM pages from around the web garner half a billion (!) monthly views, so watch out Zuckerberg, the startup-nation’s hottest new product is just around the corner.